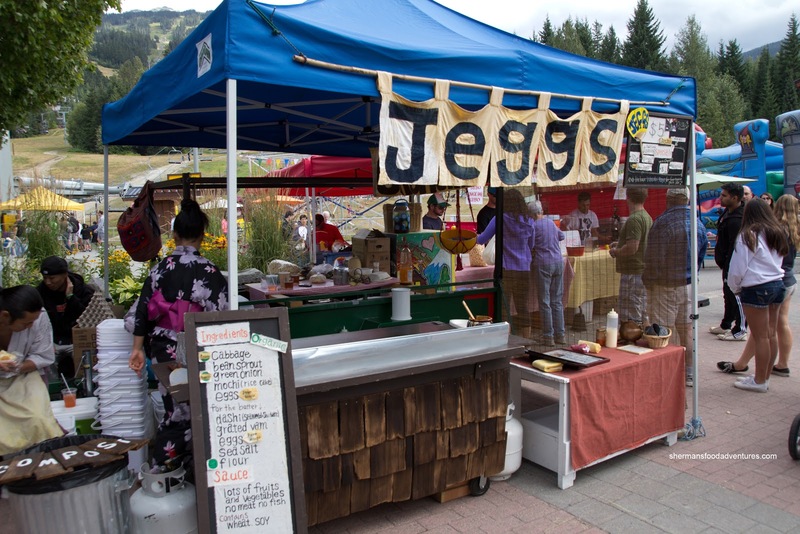 Having a bit of time to kill until we had to pack up and leave Whistler, we descended on the village to check out the Farmer's Market (which has already long ended). The first thing that caught my attention was Jeggs which was serving up freshly made Okonomiyaki. Upon closer inspection, they were cooking up the vegetarian version. Oh well, I was hungry and that didn't really matter to me. Or did it... Well... I can honestly say I did miss the meat and/or seafood. The whole thing was mostly cabbage, green onions and of course eggs. 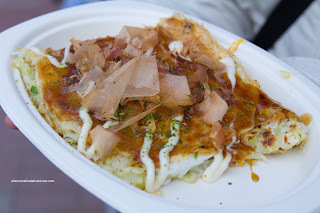 It was topped with sauce and bonito flakes. It felt more like a cabbage omelet more than an okonomiyaki. Can't say I actually enjoyed it too much despite being somewhat of a novelty. 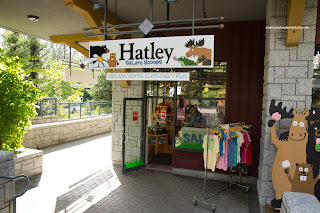 While walking around looking for more food, we sauntered into Hatley's because Bubbly was raving about their gelato. Um... 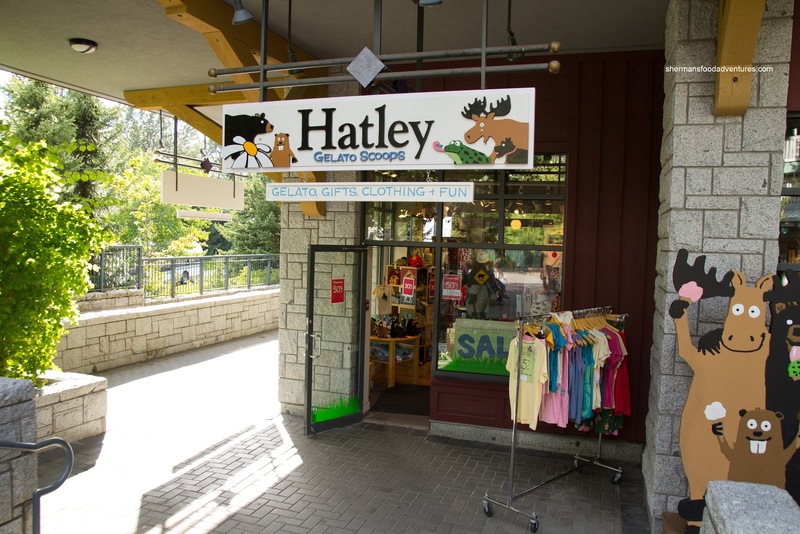 It's a kid's clothing store you know... Apparently, they thought it would be a good idea to stick a gelato stand amongst stainable clothing. Yes, gelato + kids + new clothes = ??? 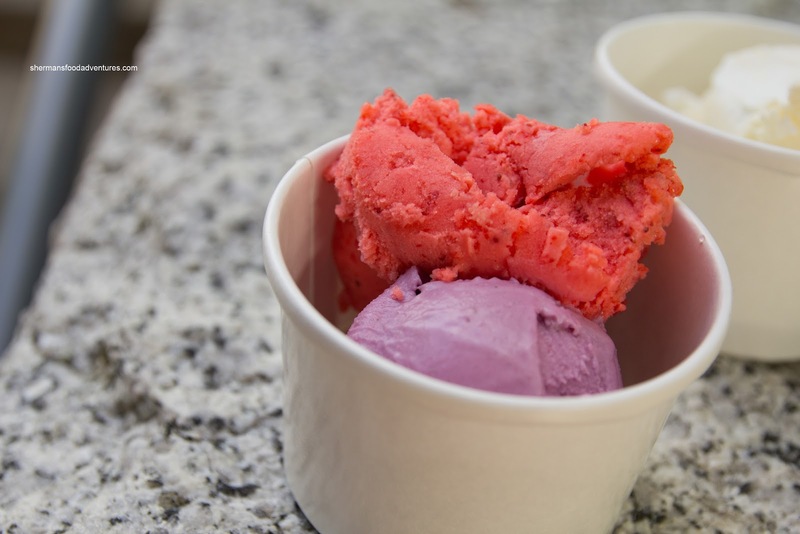 Whatever the case, we tried 3 flavours which they were nice enough to put into 2 cups. We tried the Raspberry Lime Sorbet, Blueberry Gelato and Cheesecake Gelato. The sorbet was really refreshing and not overly sweet. It was a tad icy though. As for the gelato, it was not really that rich and it was kinda dense. I preferred the richness of the cheesecake over the blueberry. Acceptable gelato, it did the job and we weren't expecting anything mind-blowing. Of course, this post was back when the weather was a lot nicer. The village is probably covered in snow right now! But you can still get the gelato (if you want in the cold), but you gotta wait til next year for the okonomiyaki (sorry it took so long to post this!). - Well, both are novelties and that's what tourists like? Maybe?